having to walk or drive through debris. 'Body retrieval, depending on the zone, when the dogs find a person it’s not always in a very accessible zone, so this allows the rescuers to find the best possible and swiftest path possible to go and retrieve that body,' says drone expert Liam Dawson of Danoffice IT. One Danish-based high-tech firm has deployed two drones over Tacloban, the worst affected area. Made from resistant plastic similar to that used in children’s toys, the devices fold away into small cases and are easy to transport. Each unit has a battery that allows it to run for up to 25 minutes. Its maximum range is 2 kilometers and it can travel as high as 150 metres. 'When organisations first saw it here, they thought it was a bit of a toy. But when they realised all the different uses it had like body retrieval, road clearance, you name it, I think this is a tool that will be used in every future disaster,' says Liam Dawson. While the data they provide is undeniably useful, such drones are a costly investment at 40,000 euros a piece. And their generalised use has raised serious concerns about the collection of data and privacy rights. The helicopter’s green alternative It looks like a helicopter and flies like one – the 'Volocopter', as its inventors have named it, is intended to be a green alternative to the noisy, vibration-heavy old-fashioned helicopter. The brainchild of three German inventors, the two-seater prototype recently made its maiden voyage in Karlsruhe, Germany. Instead of being kitted out with a combustion engine, it carries eighteen electrically-driven rotors to propel it. 'We are really pleased. Of course we expect some technical problems as we are in the early stages of development. It took us one and a half years to built the complete structure. But we’ve already had so many positive results which we hadn’t even expected,' says one of the Volocopter’s inventors, Alexander Zosel. The Volocopter takes off and lands vertically just like a conventional helicopter. Powered by a 100-kilo battery, it can reach speeds of up to 100 kilometers an hour, at an altitude of almost 2.000 metres. However, the major downside is that it only has enough power to fly for 20 minutes. Its designers are working on ways to increase this. 'In three years’ time we would like to build a small series of devices, and in five to six years time we’re planning on a much larger series. But that would only for be airborne sports. Our bigger plan for the future is of course to create a means of transport for everyone. We believe that it will be available in 30, 40 or 50 years’ time, and eventually almost anyone will be able to fly around with these devices,' says Alexander Zosel. Further tests are needed before the device can go on the market. 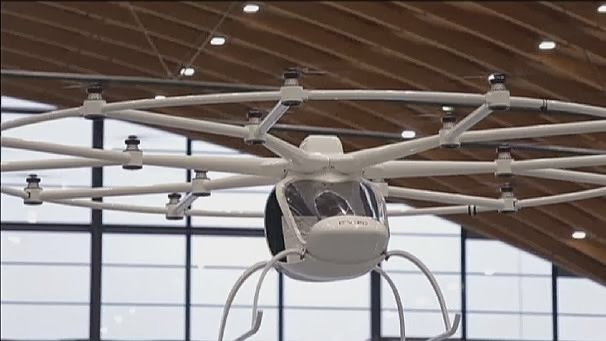 The team hopes to start selling its Volocopter by 2015 for around 250,000 euros each. They are convinced it will radically change the way we move about the planet, providing a clean, safe and reliable means of transport.